Nobody can beat FC Barcelona’s start to the current campaign. Besides winning all their domestic league matches, they’ve also won both Champions League matches; nine in total. They are out on their own at the summit of La Liga, and lead their Champions League group too. Nine wins, seven in La Liga, two in Europe;27 goals scored, and just two conceded. There is only one other team that have won nine so far, PSG. However, the French side have played ten games, drawing one in Ligue 1. 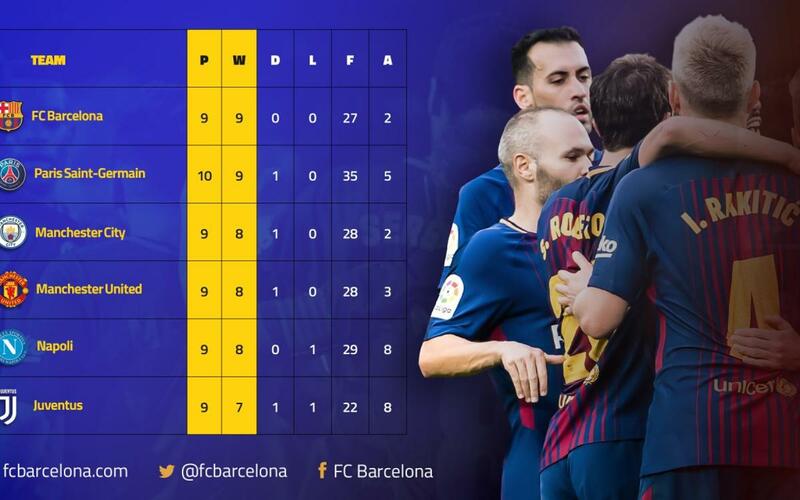 Aside from leading the way in terms of their perfect record to date, Barça are also the fifth highest scorers. The team with the most is PSG, with 35 from ten matches, and they are trailed by Napoli’s 29. Manchester United and Manchester City both have 28, and next come Barça with 27. At the other end, the Blaugrana tie Manchester City for fewest conceded; just two each.